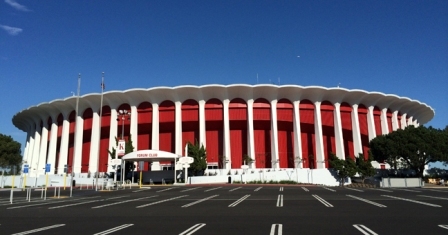 The Inglewood Forum has been the home to the city of Inglewood’s most prominent and historical events, acting as a multi-purpose venue by bringing members of the community together through concerts, church services, sporting events and much more. However, the Forum owners have filed a claim for damages against the city for “quietly” entering a deal to build a new arena down the street. “We, along with the hundreds of hardworking men and women who work to bring top-flight entertainment events to the Forum, are stunned that the city is moving forward with a plan that is in direct conflict with its existing and clear-cut written commitments to our venue,” Forum officials said in a statement. During a filing last Wednesday, the Madison Square Garden Com­pany (MSG) claimed Inglewood Mayor James Butts used a “bait-and-switch strategy” to persuade Forum executives into opening the way for the new stadium to be built on Century Blvd. across from the current NFL stadium that is now under construction and located down the street. The Inglewood City Council approved the agreement with Clipper’s owner Steve Ballmer for an 18,000-to-20,000 seat arena on June 15. The deal was secured with a $1.5 million payment to the city. In a recent statement, Mayor Butts spoke on the Forum filing a claim for damages. On Friday, July 21, the city called a meeting and announced plans to redo its approval of the deal. How­ever, Putnam has stated the law firm will continue moving forward with a lawsuit if the city does not cancel the agreement.